-T-Rex (substitutes) only appears on reel 3, during normal games and substitutes for all other symbols except scattered eggs. -The prize is double when T-Rex substitutes in a winning combination. -Scatter wins are added to line win. -A pick feature is triggered when 3 or more scattered "Eggs" appear anywhere. Select each Egg to reveal up to 10 free games per Egg. 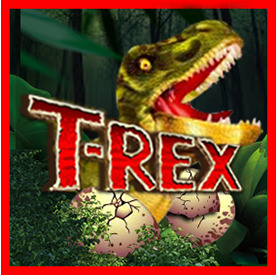 -When T-Rex appears on reel 3 during free games will eat all other dinosaurs appearing on screen and replace them with T-rex symbols, before pays are awarded. The feature can be retriggered. Free games are played at the lines and bet of the triggering game. -Progressive Jackpot can be won at conclusion of any game. The jackpot is triggered at random. Progressive jackpot wins are added to other wins. Random jackpot contribution is no more than 1.5% of total return to player.